crucified | I'm not stalking you. This week I learned that squirrels are more evil than I ever suspected. Just look at what one did to my dog! The leg is still there, just heavily bandaged. Now, I do feel like I may have helped to manifest this. I did tell my dog, Parker, he should kill the squirrel in our yard. I even told him that if he got bit or scratched in the process, I would take him to the vet and get him fixed up. I also had a plan on Friday to go to the vet and purchase more heartworm preventative. But, well, Parker impaled himself on a metal post in our yard in what I can only suspect was pursuit of a squirrel on Tuesday afternoon. 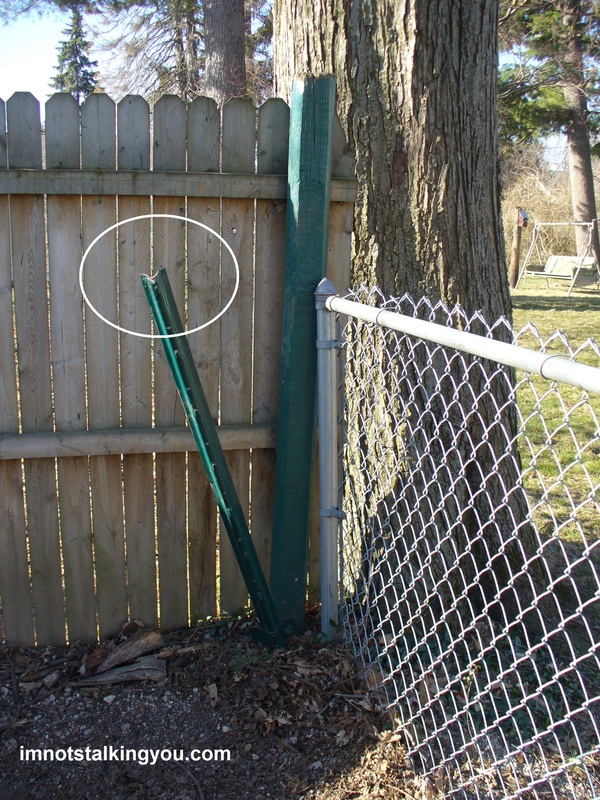 A metal post that would not have even been there except we put it there to prevent him from escaping out a gap at the bottom of the other two fences. The scene of the injury. The squirrel runs up the tree on the other side of the fence. The green post used to be straight up. I feel a little guilty. I did momentarily forget both dogs outside. But that was for like 10 minutes. Parker had been left outside unattended longer. (We have a fully fenced in yard. Not that that keeps my dogs from escape or mayhem.) And really, who expects their dog to crucify himself on a 4ft tall metal post? Tuesday afternoon, my husband is just walking out the door to go to work. He attempts to let the dogs in for me. We discover that Parker has what is (let’s put this delicately) a giant hole ripped in his front right leg doggie armpit. I grabbed my first aid kit. My husband, who JUST started a new job as a temp and CANNOT be late stayed 5 more minutes. He helped me get the injury wrapped up, and put Parker in the car. (Dude, that dog weighs 60lbs. I can’t exactly cradle him in my arms.) I called the vet. They said the doctor was out on a call and wouldn’t be back for an hour. She made it sound like I should hang out at home for a few more minutes. Then she said I could come in if I wanted and they could pressure wrap it while I waited. When I got there, she said my wrap job was good, so they just left it til the doctor returned. The doctor, without looking at it yet, said it would be 30-45 minutes and asked me if I wanted to wait or come back. She said she would give him something to make him sleepy. I waited. I skipped laying my son down for a nap because I just couldn’t bring myself to close the curtain on this poor, injured dog. I could tell when they removed Parker’s bandages. The assistant came in and told me he ripped quite the hole in himself. Then she came back in and asked if it was OK if they did a chest X-ray, because the doctor was worry he may have punctured his lung. (He didn’t.) Then the doctor came in and informed me that my dog had tried to rip his leg off, but luckily he was unsuccessful and had missed the muscle, tendons, etc. He was lucky he had missed his main blood vessel (which apparently she could see beating). If he had clipped that, she said he would have bled to death before I could have gotten him to the office. They ended giving him full anesthesia and intubating him. We were there for another two hours. Now, you might think this is a lucky dog. But remember, he is also a determined, stubborn, entitled dog. In order to not pull out the stitches, they wrapped his whole front leg to his body. Essentially, he is a tripod. Except, well, he knows his leg is still there and tries to get it out. Thursday morning my husband took Parker to get a dressing change. By the time they arrived back home (approximately 20 minutes), Parker had worked his leg out. Back to the vet they both went. My husband arrived home a second time–with a dog who had 4 legs visibly showing. We went back the third time that morning, and got re-wrapped again. This time we tranquilized him. Probably a little too much. 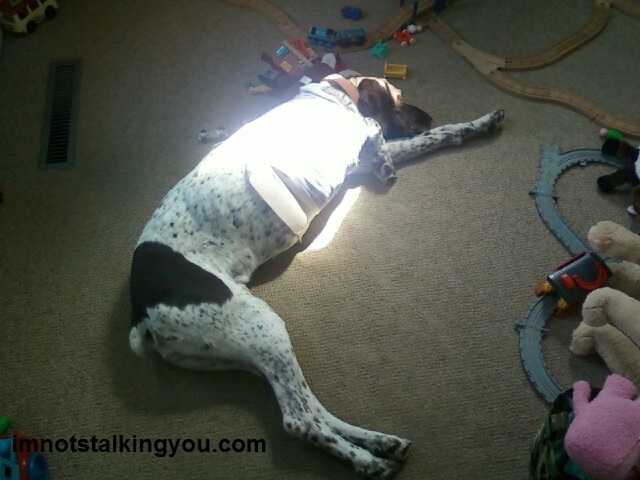 The tranquilizer was to keep him from messing with his bandage or doing silly things like trying to get on the couch. The vet also recommended greatly confining him. But my incredibly tired and exhausted husband didn’t get around to it. Or maybe he thought the dog didn’t need to be. So, I re-bandaged a drugged dog who couldn’t stand up as well as I could. He is leaky, but at least we didn’t have to take him back again. On Saturday morning, Parker had another vet appointment. He was hobbling in on his three legs, all pathetic. He got as far as the lobby and stalled, as if he did not have another ounce of energy left in his doggy body. That is, until the resident cat walked by in front of him. He did a couple of lightning quick dives trying to get it, but only ended up with a face plant. They decided to leave off his bandages because the skin was suffering from too much moisture and a lack of fresh air. So, he has his leg back, but is favoring it. We are to keep him tranquilized til his next appointment on Monday. 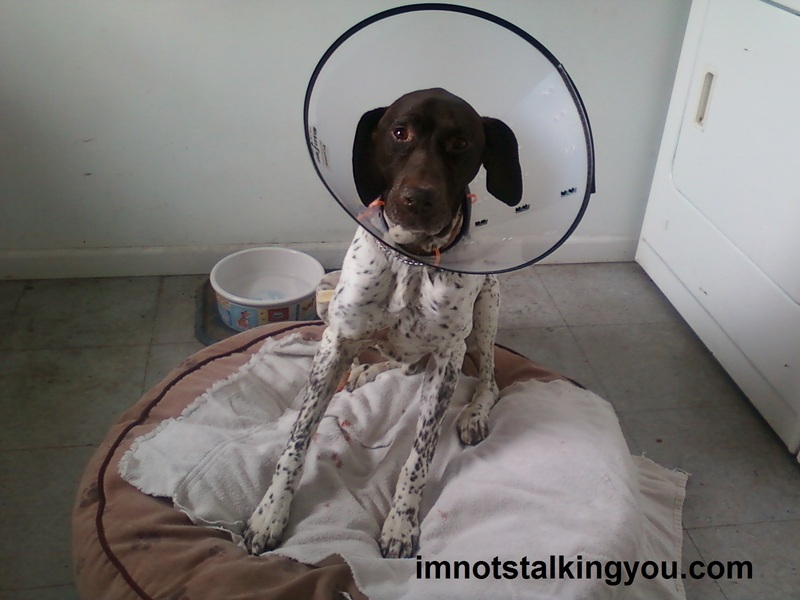 He has a giant doggie cone collar on, but I was worried about him scratching his injury with his rear foot. My mom came up with an excellent idea to put a sock on his back foot to reduce the damage. He was a little more himself today. There is a good chance he might have to have a few stitches redone where the skin is necrotic. I am worried about how concentrated his urine is, but that could be because his water intake and trips outside are way down. He is eating and drinking and pooping and peeing though, so I will take those all as good signs. My 2 month old son seems jealous of all the attention Parker is getting. So is Dave, my other dog. I am just exhausted from being a caretaker. The dog is on 9 pills a day right now. And we have to keep his wound clean and dry and put Aloe Vera Gel on part of it. I was originally going to give potty-training my boy another try next week. I think it can wait a little longer. Oy. I saw the squirrel in the backyard today. It could have just been the light or his coloring or that he had just scratched his licey, flea-bitten body, but to me it look like he had a scratch on is side. It would make me feel better about all this damage to Parker if I knew he had least took a little hide off that squirrel. Watch out, squirrel. Remember…I have TWO dogs. What did I do to myself?! 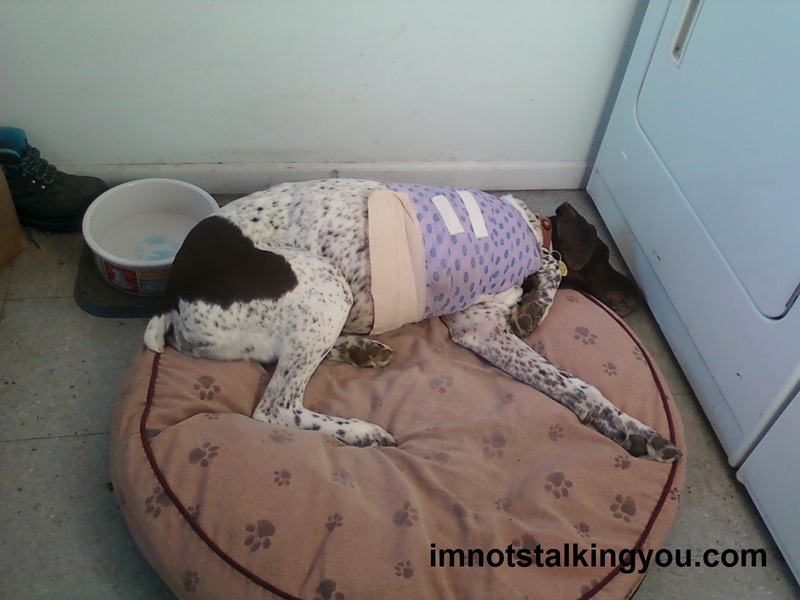 Posted in A day in the life and tagged crucified, dog, dumb, evil, German Shorthair Pointer, impaled, injury, metal, post, squirrel, stitches, surgery. Bookmark the permalink.